Who even decided stretch marks are imperfections that we should fight, hide, and prevent? It obviously wasn’t Chrissy Teigen, who shared that she finds her stretchies to be totally NBD. And at least one artist, given that she uses the skin marks as her canvas for sparkly works of Instagram art. Sara Shakeel—who grew a large following for her imaginative pieces (like this one)—has recently been posting a new series of images on Instagram—and the result is a veritable self-love movement. 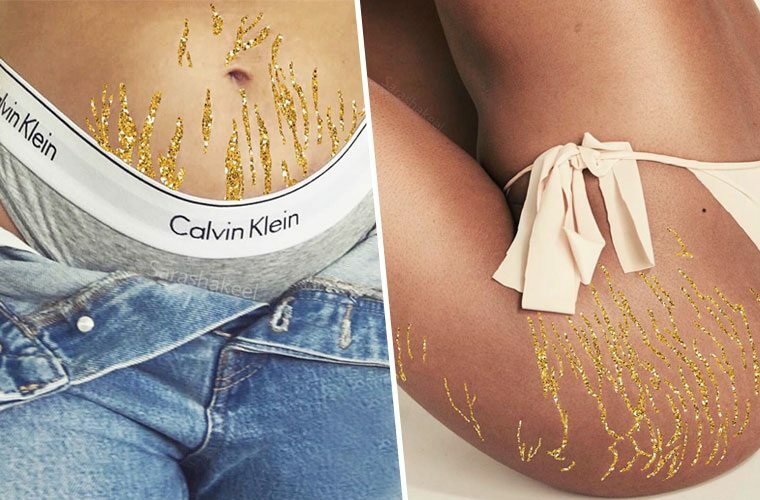 Shakeel added glitter into photos to outline women’s stretch marks, thus reimagining the feature thats all too often considered a flaw into something incredibly empowering and beautiful. Whether using gold glitter or a bluish-green mermaid color, her artwork aims to help women see their bodies in a whole new light—one that’s super shiny—because Shakeel wanted to fill her “stripes” with something pretty. But because she bravely followed through, Shakeel has gifted so many women a jolt of glitter-fueled empowerment—and she says this is only the beginning of her series. See her shimmery reimagining of this body “flaw,” below. Here’s the seven-day self-love reset you should try. Need a faster option? This is how you can find self-love in just 20 minutes.